Surf Blue, Blue cloth interior, 4 speed manual gearbox, front headrests, original steel wheels with chrome hubcaps, central locking, all original tools and manuals, full service history, mostly by the supplying dealer, only 29,000 miles. It is difficult enough to find W123 saloons and coupes in the condition we would want to sell, but we just don’t expect to find nice estates at all. Most of them have long ago been worked to death as family holdalls or tradesmens’ van substitutes, with very hard use and poor maintenance. This one is all the more remarkable in that it has hardly been used at all and has been maintained almost constantly. It was supplied new by Lancaster Mercedes-Benz of Ipswich in October 1983 to a retired Royal Artillery Major from Frinton-on-Sea. Living close to shops and railway station, and a keen walker, he used it very sparingly and had it maintained obsessively until his death in 2007, by which time it had covered approximately 27,000 miles in 24 years. Ownership then passed to his daughter, who arranged for it to be stored in ideal conditions at the local Ford dealer’s carpeted rear showroom, where it kept company with the dealer principal’s own collection of classic cars and was exercised periodically. 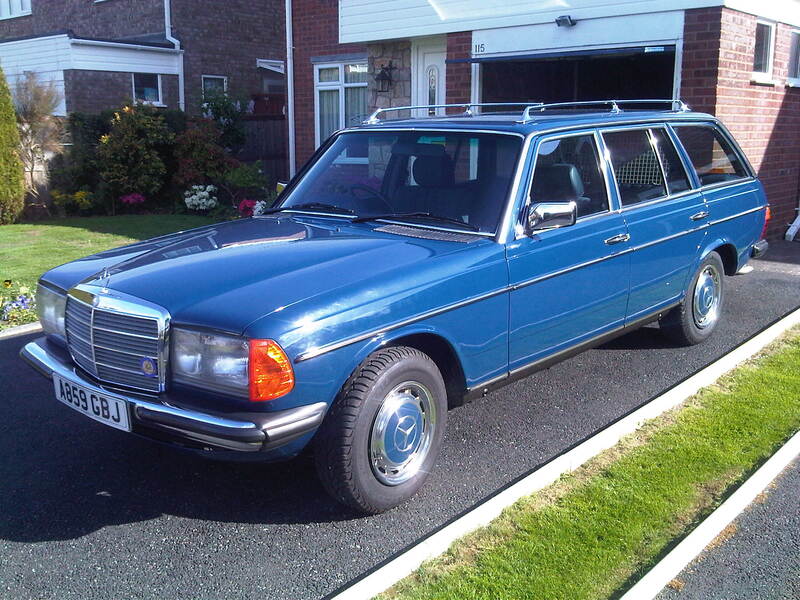 In 2011 we purchased it, after giving firm assurances that it would go to a good home, and supplied it to a fastidious car collector in North Wales where it became the third Mercedes he had bought from us and one of six classic cars in total. He carried on the sparing usage pattern and it has covered less than 2,000 miles during his four year stewardship. He is now reducing his collection due to advancing years, so we jumped at the chance to buy it back and it is now once again available to a new caring owner. In the service book there are 22 stamps by the supplying dealer from its time with its original owner, one stamp from our independent MB specialist before we sold it last time, and two from the classic-friendly garage that maintains the collection of the latest owner. The car looks as-new in the flawless mid-blue paint scheme, which is complemented beautifully by the perfect blue cloth interior. Every part of it is in absolutely top condition. We thoroughly enjoyed driving it the 225 miles from Suffolk when we first purchased it, and we enjoyed just as much bringing it the 70 miles back from its latest home in North Wales. It operates faultlessly, with all controls feeling tight and new. It has ample power and feels completely relaxed cruising at motorway speeds in modern traffic conditions. In addition to the service history, the file contains several photographs of the original owner in his army uniform and in his later years as a barrister, together with letters from his daughter detailing his life and times with the car. This must be one of the last opportunities to acquire a hardly used W123 estate with impeccable provenance, now that most of the remaining ones are well and truly past their best. Regardless of whether the new owner keeps it as a low mileage gem or uses it sparingly as an everyday car it will deliver many years of pleasurable returns, far in excess of its modest purchase price. We hope to see it regularly scooping up silverware in concours competitions for years to come.